This entry was posted in -Empath Solutions & Tools and tagged level1 on May 23, 2014 by EmpathSolutions. This entry was posted in -Empath Solutions & Tools and tagged level2 on May 23, 2014 by EmpathSolutions. This entry was posted in -Empath Solutions & Tools and tagged level3 on May 23, 2014 by EmpathSolutions. This entry was posted in -Empath Solutions & Tools and tagged level4 on May 23, 2014 by EmpathSolutions. This entry was posted in -Empath Solutions & Tools and tagged level5 on May 23, 2014 by EmpathSolutions. 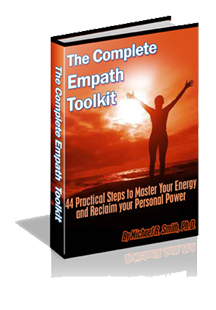 Empath Tool Kit from Dr. Michael R. Smiths got one of the best training for empaths out there. One being this whole training is specifically tailored for empaths. Unlike most materials out there where they are still talking about how to create your own boundaries and protective bubbles. Michael instead take a different spin. He focus on the fact that we as empath are made different with a different nervous system… which are a lot more sensitive and fine tune than others. We can feel intensly how other are and pick up effortlessly what the energy of the environment is. So much so, that we even soaked it up like a piece of dry desert land. Up to the point, that we can loose sense of our own identity and started feeling almost exactly like the other person. Although, I must admit, it’s a great empathic abilities when it comes to soaking up higher vibration. We can start to immediately take in the positive energy of others when we are surrounded by positive people and environment. We feel highly energetic, productive, and happy. And we can feel so intensely all these good emotions and sensitions. It’s a great experience! For that reason, I am greatful to be an empath. But what happen when it’s the opposite of we want? What are we to do? I was exactly at this place when I came across Dr. Michael R. Smiths “The Complete Empath Tool Kit” program. I was living in my beach home and feeling great. Lots of free space, high vibration and fresh air. When a new neighbor moved in. That’s when hell break lose. At least that’s how my fiance and I felt. I felt this heaviness in my heart and I was so flustered that I could not think straight. I constantly felt irritable and exasperated as if I can sit still. So much so that I had to flee and live underneath my future in-laws place. Each time I return to my ocean front home, I would feel the same thing. So much so that we leave for weeks and dread to return to our own place. That’s before we even knew anything about being “empaths”. So we searched online for answers. And came across Michael’s work. Of course, we had to get it. We are made differently for a reason. Therefore our function is set up differently. We are more like a satelite that constantly recieves message and leave leave likely to be one that is shooting out messages. Ant that has made all the difference. Rather than constant struggles, you start to see the benefits unfold and you grow into a stronger person… “a skilled empath”. It’s amazing! One useful example is as empath we can call on the sources of the universe to help. To get more energize or grounded. Meaning we can connect easily to the nature and soak up those energy to help us. We can instantly connect with… for instance the sun’s or the forest’s energy. Which is one of the reason why we feel so good after spending some time with nature. The rain, the ocean, the plants, the trees, the earth, the rocks, we can soak it up! It’s quite energizing if you try this. Go right ahead, go outside for a few minute of sunlight. It’s defintely worth the practice of getting into the habit. Because this along can bring more peace and still ness into your life now. Michael got tons of techniques and tips in on how to hone and work with your true unique powerful empathic traits. Check out his work —> The Complete Empath Tool Kit. Rather than scrampling to be like others and create barriers that doesn’t stand. We are learning to work with our strength! Use it to creat what we’ve been search for. Just got to switch our perspective and willing to re-intrepret to our unique way of looking at things. This entry was posted in -Empath Expert Guests, -Recommended Resources on October 15, 2013 by EmpathSolutions.